Toronto, 27 November 2018 – It may be cold outside, but Family Channel is keeping families warm and cozy this December with ho-ho-holiday fun on the network all month long! Christmas comes early this year with the broadcast premiere of Ross Petty Productions’ A Christmas Carol: The Holiday Musical with a Scrooge Loose! kicking off the holiday lineup this Friday. Leading up to Christmas, and beyond, viewers will also be gifted with season finales from Top Chef Junior, American Ninja Warrior Junior and The X Factor; back-to-back Peanuts classics on Christmas Eve; and wonderfully winter movies and specials from hit series. The Family Channel App and Family OnDemand will also be stuffed with tons of festive programming for the whole family this holiday season. 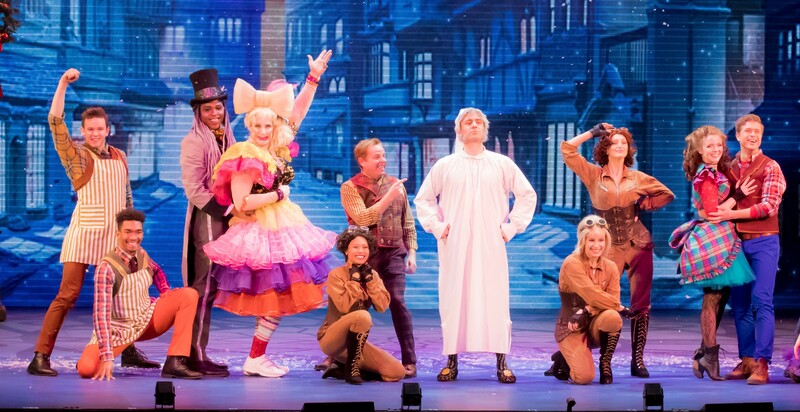 Ross Petty’s A Christmas Carol: The Holiday Musical with a Scrooge Loose! debuts November 30. Family viewers are definitely on the nice list this year, being treated to the world television premiere of Ross Petty Productions’ A Christmas Carol: The Family Musical with a Scrooge Loose! on Friday, November 30 at 7 p.m. ET/PT. Layered with rapid-fire humour for the entire family, the story finds Scrooge as president of Scrooge Enterprises and launching a new smartphone app that will ruin Christmas by forcing a crippling sales tax on the population. Throughout December, more seasonal specials and festive flicks will be added to the lineup, including: Jingle All the Way, Elf, Santa’s Apprentice, Nativity, The National Tree, The Flight Before Christmas, Switchmas, Get Santa, Santa’s Little Helper, Hank Zipzer’s Christmas Catastrophe and more! The holiday cheer continues with three fan-favourite series crowning champions: the two-night season finale of The X Factor concludes on Saturday, December 8 and Sunday, December 9 at 7 p.m. ET/PT with the Season 15 winner revealed; American Ninja Warrior Junior wraps up on Monday, December 17 at 8 p.m. ET/PT with the final contestants running the course; and finally, the Top Chef Junior kitchen serves up a winner in back-to-back finale episodes airing Tuesday, December 18 and Wednesday, December 19 at 8 p.m. ET/PT. A Charlie Brown Christmas – December 24 at 6 p.m. ET/PT: With psychiatric advice from his good friend Lucy, Charlie Brown sets off to find the “perfect” Christmas tree to uplift his sorrowful mood for the holidays. It’s Christmastime Again, Charlie Brown – December 24 at 6:30 p.m. ET/PT: Christmas is just around the corner and in celebration, Charlie Brown is raising money to buy new gloves for his crush, Peggy Jean. I Want a Dog For Christmas, Charlie Brown – December 24 at 7 p.m. ET/PT: Lucy’s younger brother, Rerun, invites Snoopy’s sibling to town, in hopes that his mom will let him keep a dog this Christmas. Happy New Year, Charlie Brown – December 31 at 5 p.m. ET/PT: Charlie Brown is obliged to attend Peppermint Patty’s New Year’s Eve party, even though he has to finish the novel War and Peace. The fun continues beyond Christmas Day, with brand new episodes from top animated series Johnny Test, Alvinnn!!! and The Chipmunks, Home: The Adventures with Tip & Oh and Supernoobs airing weekday afternoons from December 27 to January 6. Fans taking a break from sledding and snowman-building can catch blockbuster movies every morning at 10 a.m. ET/PT. Families can cozy up on the couch and relax on Boxing Day with a Wipeout marathon, featuring 17 back-to-back episodes beginning at 6 a.m. ET/PT. For families on the go this holiday season, most of Family Channel’s December specials will be available on The Family Channel App. Family OnDemand will also offer holiday episodes and movies. For a complete December programming schedule, visit Family.ca. Family Channel offers the best in family television entertainment in a premium, high-definition, multiplatform environment. Dedicated to celebrating family life and providing a daily vacation for Canadian families, Family airs a unique mix of top-rated Canadian and acquired series, movies and specials. Family Channel subscribers have access to the Family Channel App, Family OnDemand and Family Online at no additional cost, to see hit movies and series when they want them, where they want them. Visit us at Family.ca. DHX Television is composed of Family Channel, Family CHRGD, Family Jr. and Télémagino, and is part of DHX Media Ltd., a leading creator, producer, marketer and broadcaster of family entertainment. Dedicated to celebrating family fun, DHX Television delivers best-in-class programming through premium subscriptions and its original production mandate, and creates and produces captivating in-market events that appeal to Canadian families. DHX Television is home to world-renowned series including The Next Step, Degrassi: Next Class and Teletubbies. DHX Media Ltd. has offices globally, and is traded on the NASDAQ and Toronto Stock Exchange.